Vim is my editor of choice and Rails is my framework. I think many of us have the same taste and I want to share with you my experiences while using both. I’m going to write a series of posts regarding this topic. I start with what you can’t miss when you decide to use both rails and vim seriously. So you use vim, you code in Ruby and you are building the most exciting web-application of the world with Rails. But, in spite of that, you are still searching for a way to make your vim/ruby/rails coding more productive. First of all, you need some plugins even you are still not aware of that. I mean you have rails.vim, NERDTree and FuzzyFileFinderTextMate, don’t you? Obviously what I am saying is kind of a joke but, as always, it’s a bit of reality too. When you are working on a feature that involves many files you have to switch among them continuously. It implies that you have to close the file you are editing, navigate your file-system to find your next file and open it for editing, which could become a WTF work-flow very quickly. A first glance solution could be to open all the files you want to edit with the -O/-o vim option but, come on, nobody knows how many files have to be edited before the work starts. For example, consider the problem of editing a view, say an index, and the correspondent controller. You edit the controller to dig some records out, then you go to a browser and discover you need an extra field in your awesome HTML table. So you have to close the index file and open the controller file with vim. Yes, I am talking about a few seconds but, you know, a few seconds spent a great number of times in a day mean a waste of time. The solution for this problem is called rails.vim by our true hero tpope. This plugin isn’t just a must-have for the vim/ror combination, it’s your only choice because it’s simply awesome. Probably you are familiar both with the goto File gf vim feature and with the vim command-line. Well, tpope did an incredible job to make our vim life simple, and the aspect that hits me more is the pure vim spirit in which it has been developed. The gf feature of vim is extremely useful even with default behaviour (take a look at help) but rails.vim has made goto file Rails oriented. Practically, rails.vim adds a bunch of your project directories to vim path. This feature is sure to make you happy. Please, try to open a controller, put the cursor on the name of a model, then type gf. Voilà! rails.vim opens that model for your editing pleasure. Furthermore, this incredible plugin gives you a number of extremity useful command such as :A or :R. Digging into rails.vim features is a real pleasure, there are commands like :Rcontroller, :Riew and :RModel. I guess it’s not a problem to figure out what they do. The aspect you’ll love more is that the plugin commands work in the vim way. In addition to all these nice features, rails.vim can do for you other nice stuff like automatic partial extraction, interfacing rails scripts and integration with other awesome plugins. 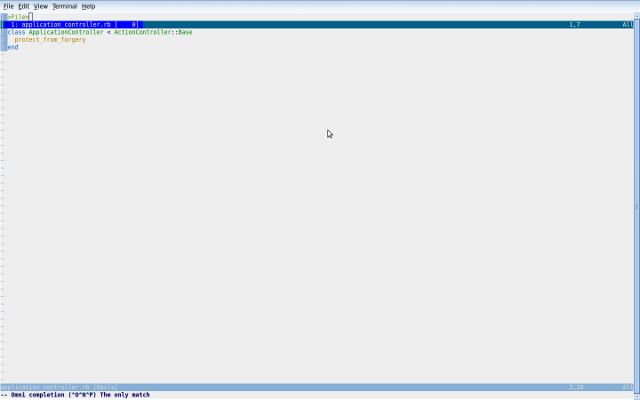 So, go straight to http://rails.vim.tpope.net/, download and install it. I can assure you - the boost of productivity will be incredible. Furthermore, it comes with a handy mapping to open sub-directories and files in your vim instance. I confess I don’t use it very much but in certain situations it is absolutely useful. Traversing your project directories could be a zen way of thinking about the project itself, in such moments NERDTree will give you a hand. While writing this post, I have deliberately omitted all the effort and all the hours spent configuring vim. This choice is a consequence of two simple ideas. First of all, I hope you could have focused yourself on what you need to change in vim for Rails development. Secondly, I’m a free person and I don’t like it when someone tells me how to configure my tools of choice to their own taste. That doesn’t mean though I don’t like to read other configurations, indeed, sources like https://gist.github.com/gists/search?q=vimrc&page=1 can be a great source of inspiration and a good way of learning new things.